The purpose of a combat is to destroy all creatures in the opposing army; after that their lord is considered defeated. After settling the troops, you get involved into a combat with your opponent which flows by certain rules. The combat ends with a victorious and a defeated side, there can be no draw. Both sides get skilled in leading their faction's troops, but only the winner gets combat experience. The combat arena consists of the battle field and some control panels. In the lower middle part of the screen there is an initiative panel (the so called ATB bar or scale, on the left the turn timer is displayed. Combat log window is positioned under the ATB bar. It holds description of the main events on the battle field, as well as messages sent by players during the combat. 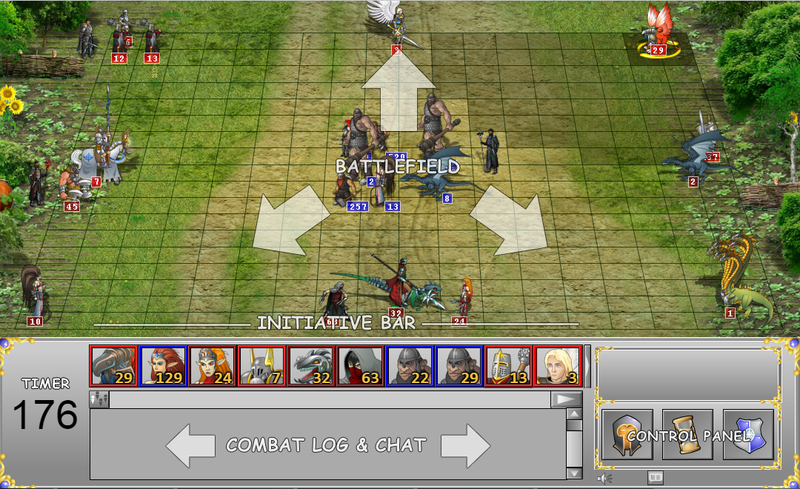 During combat, you will receive control upon your troops in the order seen at the initiative bar, from left to right.